The Mines and Geosciences Bureau conducted the Training in the Deployment and Configuration of Active Directory Domain Services in the MGB Network Environment on October 15-20, 2018 at NTT DATA PH Training Center in Makati City. In line with the transparency initiatives of the Government, a Microsoft Certified learning course is to be completed by the MGB Information Technology Specialists. The five-day instructor-led Course 20742B: Identity with Windows Server 2016 taught IT professionals how to deploy and configure Active Directory Domain Services (AD DS) in a distributed environment; to implement Group Policy; to perform backup and restore; and to monitor and troubleshoot Active Directory-related issues with Windows Server 2016. Additionally, this course taught the participants how to deploy other Active Directory server roles such as Active Directory Federation Services (AD FS) and Active Directory Certificate Services (AD CS). The training was specifically designed for the MGB Information Systems Group and the IT Specialists of Regional Offices. It aimed to prepare the participants for the next phase of the agency’s continuing upgrade of its network. The participants are expected to deliver the output, Active Directory Configuration and Implementation, one month after the completion of the training. The AD DS Training was funded by lnfoBahn Communications, Inc., the Project Contractor for the MGB Network Enhancement, as part of the project’s Phase III. On Day 1 of the training, Mr. Enrique Castillo Jr. II, Microsoft Certified Trainer of NTT Data PH Training Center, laid out the Expectations, House Rules and Overview of Modules. He also initiated the Introduction, Background and Common Applications of Active Directory. The importance of Active Directory was underlined in that it helps the personnel-in-charge control the organization’s users, user groups, computers, devices, security settings through certificates, the operating system environment, roles and access to resources through policy settings. It can organize the bureau’s complete hierarchy to which computers belong in a particular network and can easily replicate policies from top management down to the lowest level users in minutes. It improves the infrastructure while securing data at the same time. Module 1 focused on Installing and Configuring Domain Controllers. The laboratory for Module 1 then followed. Module 2 delved into Managing Objects in Active Domain Directory Services while Advanced AD DS Infrastructure Management was presented for Module 3. The laboratory for Modules 2 and 3 ensued after the presentations. On Day 2, the Active Directory Training was given a pause for one day to give way to Technology Updates implemented in the MGB Network which is an in-house training. Mr. Jeffrey Ledesma, ICT Officer of Information Systems Group of MGB Planning, Policy and International Affairs Division presented the vision behind the AD Training and future plans. With the vision of “One I.T., One Network, One MGB,” the ICT Group of the Mines and Geosciences Bureau believes that the MGB must share the same policies, resources and technological advancements that are interconnected and interactive as an organization. Mr. Ledesma stressed that a region must not be left behind and all must work as a single unit. He added that the MGB must thrive in securing its network and data from multiple threats without compromising public service. As a final point, he stated that the MGB IT Specialists must push through obstacles and barriers within and outside the bureau to take it to global standards while helping to uphold its mandates. On the same day, Adobe Inc. as the Information Systems Group of PPIAD from MGB Central Office introduced the newest products and product updates of Adobe Inc.’s leading application software. Information on MGB’s license subscription with Adobe was also disseminated. Moreover, a demonstration of Bitdefender Antivirus’ features, advanced analytics and reports using a web-based dashboard was conducted by representatives of the local distributors. In the same way, the Sophos Firewall was presented. An open forum on how to manage and apply policies to the firewall appliance, Sophos, followed. Questions regarding bottlenecks encountered by the participants in respective Regional Offices were raised and answered by a Sophos certified specialist from Infobahn. Information about best practices on security threats management using the Sophos Firewall was also shared. On Day 3, the Active Directory Training resumed. Mr. Castillo continued to facilitate Module 4 which was all about Implementing and Administering AD DS Sites and Replication and followed by the laboratory on Module 4. In the same vein, Module 5 which tackled the Implementing Group Policy was followed by a laboratory period. On Day 4 of the training, Mr. Castillo went on to discuss Module 6 on Managing User Settings with Group Policy and Module 7 on Securing Active Directory Domain Services. The laboratory on Modules 6 and 7 took place after the discussions. Module 8 centered around Deploying and Managing AD Certificate Services. It was followed by a laboratory period. On Day 5, the Active Directory Training continued. Module 9 tackled Deploying and Managing Certificates and Module 10 discussed Implementing and Administering AD Federation Services. Modules 9 and 10 laboratories followed after the presentations. Module 11 on Implementing and Administering AD Rights Management Services was the last presentation of the day. The laboratory for Module 11 ensued thereafter. On the last day of the training, two modules were discussed. Mr. Castillo presented Module 12 on Implementing AD DS Synchronization with Microsoft Azure AD and Module 13 on Monitoring, Managing, and Recovering AD DS. A laboratory period followed after said modules. The activity culminated in the distribution of certificates and photo opportunities . 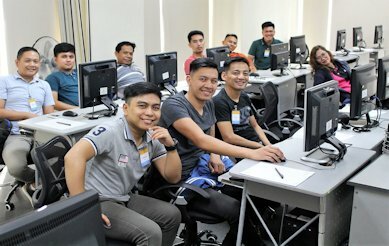 Before returning to their respective regions, the participants visited the MGB Central Office and were taken on a tour of the bureau’s very own data center in Quezon City.